We know that in today’s crazy, busy world, time is money. 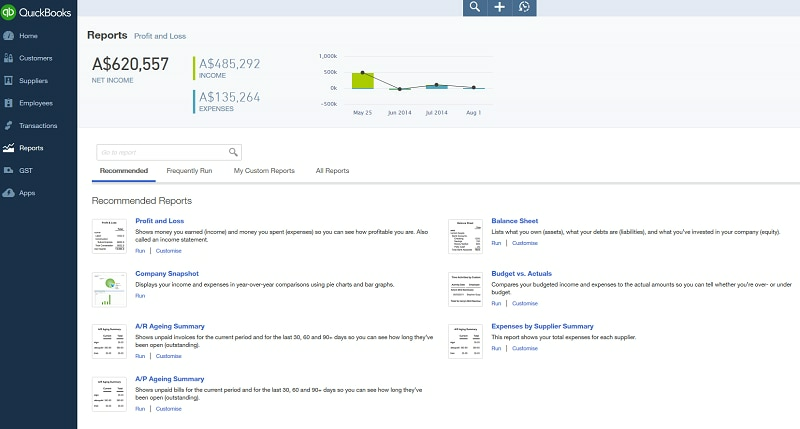 So we’ve designed Intuit QuickBooks Online to help you get your work done quickly. And we’re not just saying that. 77% of Australian small businesses we surveyed as part of some product comparison research we commissioned agreed it’s fast to finish tasks in QuickBooks Online (compared to just 49% for Xero – read more here). One of the key features our customers love is reports, so we wanted to show you how quick and easy reporting is with QBO. Check out these videos on how to use reports and how to customise reports , or read on for some step by step info. To access Reports, click on Reports in the left-hand navigation bar. Scroll your mouse over each report’s listing to view a sample preview of the layout. You can run the report immediately by clicking on it or you can customise it first before the report initially appears. You can also search for a particular report by typing any part of the report name in the Search field. The two most frequently produced reports are the Profit & Loss and Balance Sheet. They are found at the top of the Recommended and All Reports sections of the Report Centre. Any reports you run regularly will be listed in the Frequently Run section for quick, easy access. Using QuickBooks Online, you can have reports automatically sent by email to yourself and others at regular times (e.g. 1st of the month). Any customised reports can also be saved as part of a Report Group. And a Report Group can contain one or more reports, for your fast reference. Highlighting the Report Group in My Custom Reports and selecting Edit will open the Report Group Settings window for this group, and this is where the email settings are created so you can send! Just specify the recipient(s), along with the subject line and the text of the email, and then the report(s) can be set to be attached as Excel files, and the schedule of the email of the reports can be set as well. The recipients do not have to be QuickBooks Online users and QuickBooks Online does not even have to be running for these reports to be sent on schedule. Smart huh?! Have a question? We’re available on Twitter @QuickBooksAU.